¶ 3 Leave a comment on paragraph 3 0 I Want You was release as a single, ultimately reaching number twenty on the Billboard charts. It’s not hard to understand why. 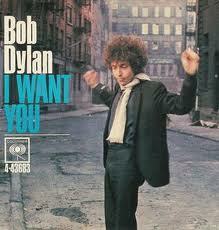 I Want You is one of the most melodic and pop-sounding songs in the Dylan catalog. ¶ 4 Leave a comment on paragraph 4 0 I Want You was recorded with Al Kooper on organ, a holdover from the earlier NYC sessions, and Nashville musicians pulled together by record producer Bob Johnston. Kooper part is especially interesting. He played a Lowrey organ on the track, the same type used by Garth Hudson on many The Band and Dylan/Band recordings. ¶ 5 Leave a comment on paragraph 5 0 One of the most striking aspects of the song is that it takes the cliched love lyric about being ‘born to be with somebody’ and turns it around. In this song the singer doesn’t sing the cliched ‘I was born to be with you’, but rather “I wasn’t born to lose you”. In other words, the singer doesn’t believe in some fairy tale magical destiny, but now that he has happened into something great he’s not going to let it go easily. ¶ 6 Leave a comment on paragraph 6 0 Like many Dylan songs, there is no clear narrative flow. It seems to be a pretty complicated scene, with as many as three different women involved. There’s the object of affection of course, but there’s also the Queen of Spades who he “returns” to, and the Chamber-Maid who the narrator is “not afraid to look at” (The Queen of Spades and the Chamber-Maid could be the same person – it’s not clear). ¶ 7 Leave a comment on paragraph 7 0 Dylan often refers to women as ‘queens’. He does so in Just Like a Woman (“Queen Mary”), Need a Woman (“Well I need a woman to be my queen”), and Gates of Eden (“two-wheeled gypsy queen”). ¶ 12 Leave a comment on paragraph 12 0 I always found the final verse of the song especially confusing. ¶ 14 Leave a comment on paragraph 14 0 Who is this child in a “Chinese suit”? Interestingly, Paul Williams suggests that the character is a romantic rival that the narrator wants to drive away. In his live shows Dylan almost always skips this verse. ¶ 15 Leave a comment on paragraph 15 0 Dylan has performed this song many, many times. It appears on two live records, At Budokan and Dylan and the Dead. The slowed-down version on Budokan is pretty good, one of the better cuts on a very mediocre record. The Dylan and the Dead version is, like almost everything on the record, awful. The song was also recorded for the Unplugged album, although it didn’t make the final cut. It’s a very slow version that works well. I’m not sure if it exceeds the original, but it is definitely worth a listen. ¶ 16 Leave a comment on paragraph 16 0 And one more thing. The song also has one of Dylan’s most inventive rhymes – “interrupt” and “broken cup”. Good one! Thanks for the comment. That’s interesting. I wonder if he just just “mis-sung”, wouldn’t be the first time. Or perhaps he wanted it that way. I just listen to the Dylan and Dead version, he sings it the official version there. These are the official (website) lyrics, but what Dylan actually sings is “She knows that she’s not afraid to look at her.” The cast of characters is uncertain and their interactions are very tangled. Interesting, thanks for the comment. I wonder if he just “mis-sung”, wouldn’t be the first time, or he wanted it that way? I just listen to the Dylan and the Dead version. He sings it the “official way.